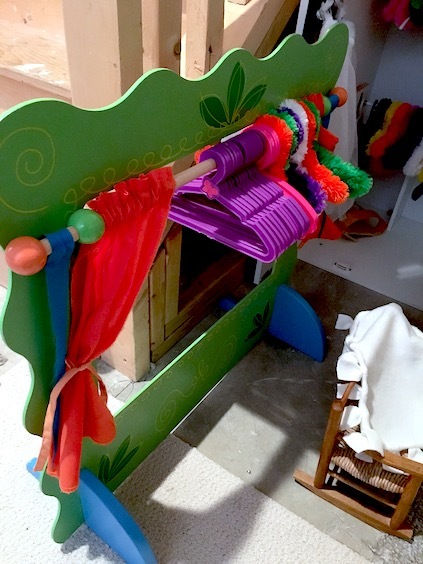 At the start of this new year, I decided that it was time to clean out the old closet…the doll closet that is! After sewing up a storm this past Christmas, I really didn’t want to just toss all of those lovely handmade items onto the pile. 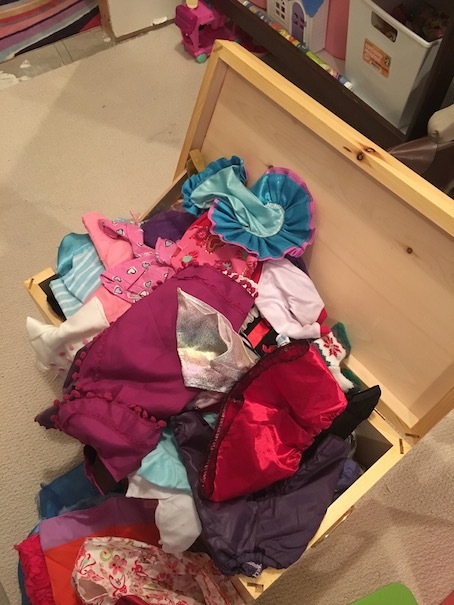 Basically I was just sick and tired of rummaging through this every time the dolls required a costume change. 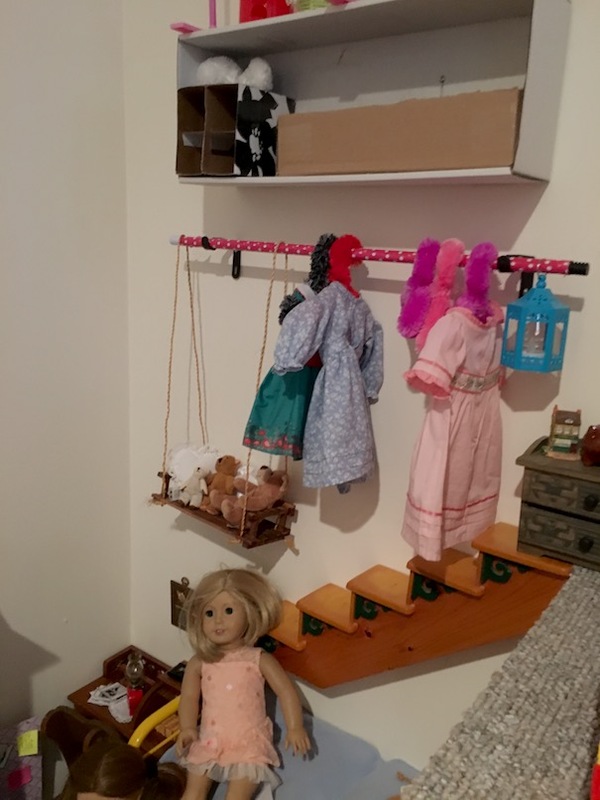 Now, awhile back I found a toy chest for $10 and turned it into a doll wardrobe. This picture makes me laugh because it pretty much speaks for itself, doesn’t it? All of that closet space, and yet, nothing has ever been hung back up on the hangers. But I get that. I mean really, hanging up clothes is a chore. Playing with your dolls should not be a chore. We also have this lovely storage option. As you can well see, none of our previous storage options were being used to their full potential. I decided that something had to be done. 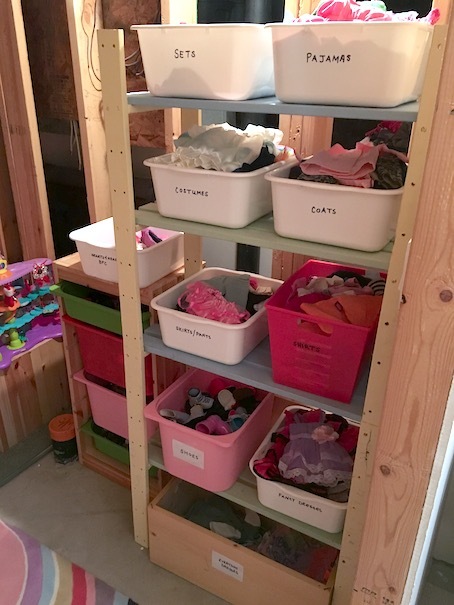 We needed a doll clothes storage option that would be versatile, easy to keep clean, easy to access and easy for the kids as well as myself to keep organized. Ok, I know what you’re thinking. It’s not pretty. It’s not Martha Stewart either, but whatever. I was desperate, and this is a solution that I can live with for now. Maybe I will get some prettier boxes later, and some pretty labels printed out on pretty scented paper, or maybe I will add some bows and ruffles and lace. Nope, who am I kidding? I’m faking it mostly! That means that I’m mostly just winging it until it works! LOL! I have to say though, this little system is pretty handy. Need some shoes for your doll? No problem. Fancy dress ball? We are on it. Need that perfect Dolloween costume? We’ve got you covered. Coats, skirts and dresses? We’ve got ’em! 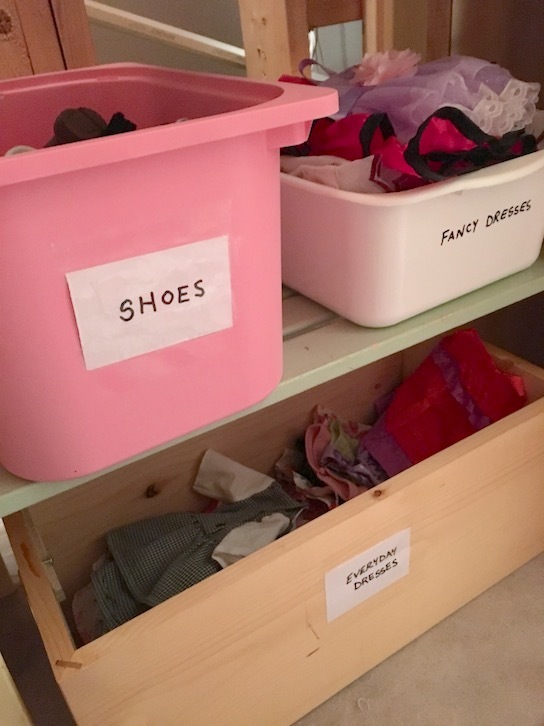 I already have a decent storage solution for the smaller items like leggings and socks and undies, swim suits and hats etc. But you could definitely add those in there if you have the need. The sky is the limit really. I just like that everything is easy to find! Anyway, I hope you enjoyed! < Previous NEW YEAR’S RESOLUTIONS! Looks good! It is a continuous challenge because, if you are like me, there are always new things being added! 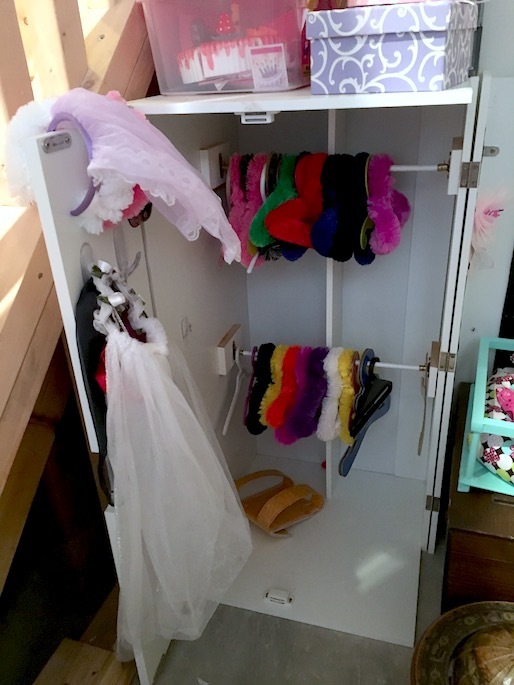 I have a combination of things–a rolling cart and a hanger system I use for dresses only. It works for now, until I come up with something better! I know! Especially if I keep sewing dresses! LOL! I don’t want them all just piled on top of each other in the bin but at least this way, they are somewhat organized. 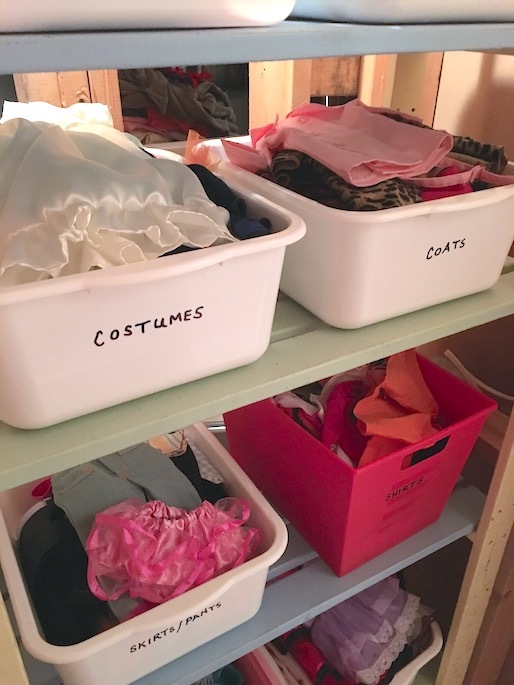 My doll stuff looks like it’s a sloppy mess, bursting at the seams but in my head it’s all organized. I’ll have to be brave and do a post on it sometime.